Today's post is by Carrie A. Meyer, author of Days on the Family Farm: From the Golden Age through the Great Depression. The book chronicles the experiences of May and Elmo Davis, distant relatives of Meyer who kept a diary about the couple's everyday experiences on the farm. The book showcases the large-scale evolution of agriculture from horses to automobiles and tractors, a surprisingly vibrant family and community life, and the business of commercial farming. In this post, Meyer points out little-known aspects of farmers markets and farming history. Meyer, who grew up on a farm in Illinois, teaches economics at George Mason University. But they also bought groceries regularly, even in the summer. Sugar, flour, and coffee were year-round staples; by 1908, so were crackers and breakfast cereals, including Grape-Nuts, Corn Flakes, and Ralston. Today’s locavores might be surprised to learn that in January and February of 1908, May and Elmo also bought oranges, bananas, celery, radishes, lettuce, pickles, bread, cakes, cheese, peanuts, ice cream, raisins, dates, and even oysters. (Oysters were popular in their Northern Illinois community, settled by New England Yankees.) In July and August of 1908, they bought lemons, muskmelons, bananas, onions, and meat regularly, including mutton, “frankfurts,” and smoked ham. A hundred years ago, even farmers ate many foods that were not produced locally. Yet today, as the documentary Food, Inc. points out, Americans have become woefully disconnected with the sources of their food. Children are raised on soft drinks and junk food. Far too few children have planted a seed and watched it grow into an awesome zucchini or have watched a fluffy yellow ball turn into a chicken for the dinner table. Few carnivores like to be confronted with the reality of large confinement animal farming operations. Are they ethical? Does it make sense to raise farm animals (and produce manure!) so far from the crops? In May and Elmo’s day, the manure from the hogs and cattle would enrich the soil to grow the corn and other crops. Insects and plant pests were controlled by successive crop rotations. Different crops make different demands on the soil and make different contributions. Corn (which loves nitrogen) would follow clover (which fixes nitrogen in the soil). Then farmers would plant small grain, like barley or oats. The following year the volunteer grain would enrich a crop of hay. The pig pasture would also be rotated back into crops. Such rotations were surely better for the soil and more pleasant for the farm animals. The work of Michael Pollan (whose book The Omnivore’s Dilemma was the basis for much of the movie Food, Inc.) has encouraged the growth of farmers markets, home gardens, and a healthy conversation about food and where it comes from. For this I am grateful. But his work also contains misconceptions about the history of farming. Myth #1: Farmers were not too sophisticated back in the golden age of family farming. Early in his book Pollan notes parenthetically: “there were only 225 tractors in all of America in 1920” (Dilemma, p. 38). In fact there were 246,000 tractors in the United States in 1920, and 2.2 million automobiles on farms (U.S. Bureau of the Census, series K184 and K186). In Iowa, 73% of farms had one or more automobiles in 1920 (U.S. Bureau of the Census as recorded in Dept. of Commerce, Statistical Abstract of the United States 1925, Table 558, p. 602). Many people think farmers bought tractors before they bought automobiles, but that is not the case. Myth #2: “Beginning in the 1970s Iowa farmers started alternating corn with soybeans” (Dilemma, p. 40). Iowa farmers actually planted 1.2 million acres of soybeans in 1935 (The USDA National Agricultural Statistics Service provides this information online; select “Crops and Plants”). They were already alternating corn with soybeans. (Elmo experimented with soybeans in the mid-1920s; so did Iowa farmers.) During World War II, farmers were encouraged to plant more soybeans, and Iowa farmers upped their soybean acreage to two million acres. Acreage devoted to soybeans grew steadily throughout the next several decades. In the 1970s, farmers in the United States grew enough soybeans to begin exporting them to other countries. 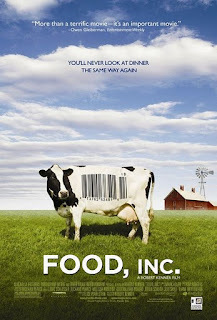 So, while I look forward to fresh greens and radishes from my favorite local farmer this season, I understand why many have found Pollan’s book and the movie Food, Inc. hard to swallow. I am troubled when the derisive label of “corporate farmer” is attached to farmers whose great-grandfathers were farmers, just because they grow corn and more of it than their ancestors did. To improve food policy, greater understanding between farmers and consumers will be required. Meeting at the farmers market is not a bad way to begin. -For more information on farmers' responses to Food, Inc., visit the American Agri-Women site and scroll to "A Response to Food, Inc."
-Find out more about Carrie A. Meyer. -Learn more about Meyer's book Days on the Family Farm. Interesting perspective Carrie, thanks for sharing it.